The Results You Want. The Care You Deserve. To ensure optimum results and shorter recovery times, all of our patients receive proven evidence-based treatments, administered by our Doctors of Physical Therapy. We do not use any physical therapy technicians or aides, so you receive expert care from board certified, experienced clinicians 100% of the time. To guarantee you receive the hands-on, award-winning care you deserve, each patient is treated in private patient rooms, instead of commonly used row of tables in an open bay. We strive to create a positive atmosphere, combined with enthusiasm to provide the best rehabilitation experience possible. Every person is unique, thus they will have different physical therapy needs. We effectively identify the cause of your specific problems, and comprehensively solve those problems on an individualized basis. 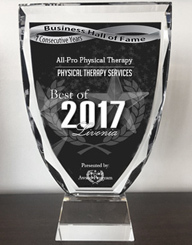 So you receive the most beneficial physical therapy treatment solutions to achieve your personal goals. Give us a call, and let us help you move beyond your current injury & take your health, sports performance, and fitness to a higher level. How Do You Determine Which Physical Therapy Clinic Is Right For You? By becoming an educated consumer, you gain the power to take charge of your health and quickly return to doing what you enjoy the most. You can choose where to receive physical therapy treatments. When you need care, your therapy experience and the benefits you receive greatly depends on the provider you select. To help determine which physical therapy clinic is best for you, consider comparing at least 2 different facilities. Give them a call or even better stop by and visit the facilities, and speak to one of the physical therapists about your medical condition. This will enable you to get an idea about the physical therapist’s level of expertise in treating your specific problems, facility’s character, and technological capabilities. Please Give Us A Call – To schedule an appointment now! Or Fill Out The Appointment Request Form – Our staff will be in touch with you promptly. Thank you! Please Select the Clinic Location of Your Choice. Make Your Work Space Fit You!